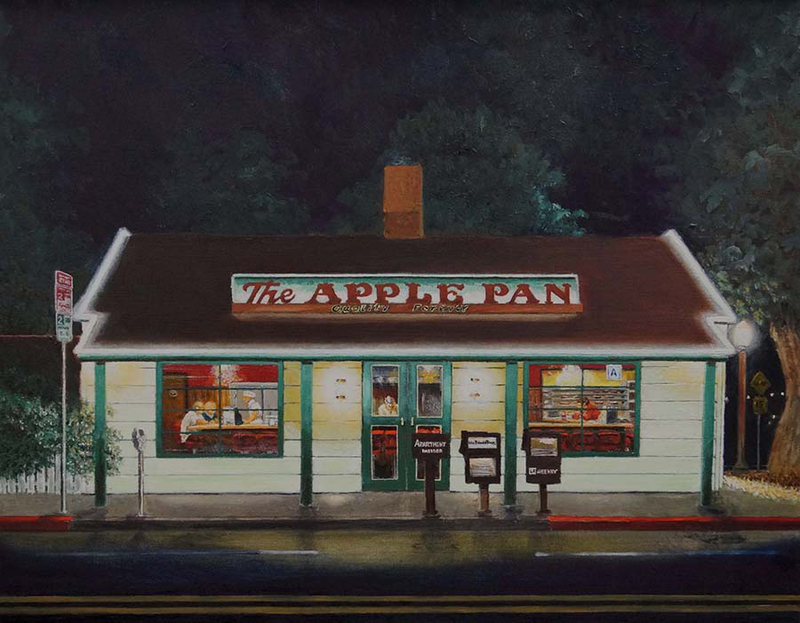 -- The Apple Pan (An Ode To Edward Hopper) Los Angeles, CA: One of may favorite haunts for burgers passed by late at night reminded me of one of America's most admired artists. 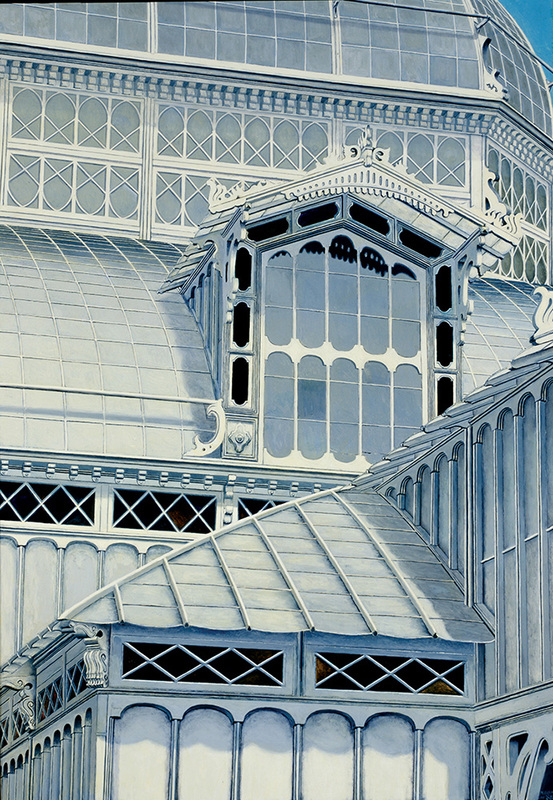 -- Arboretum Golden Gate Park, San Francisco, CA: It took 18 months to get all the windows straight. There is no reflection in the windows since they are painted white. 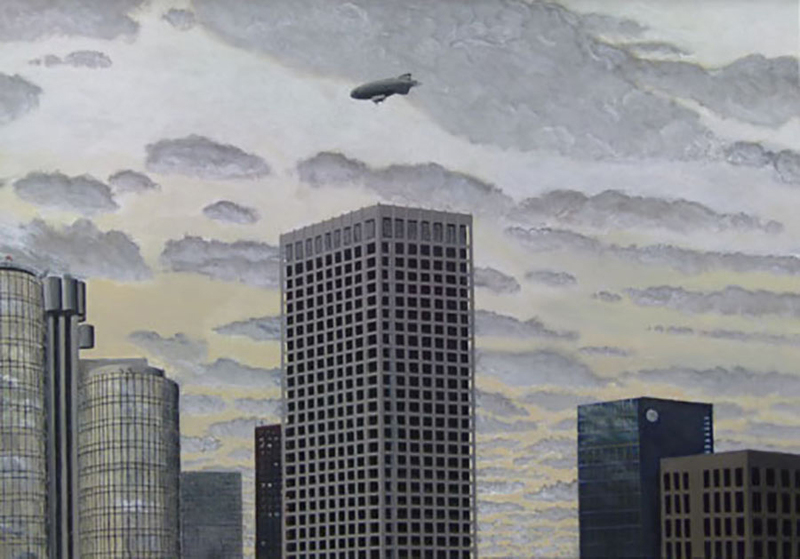 -- L.A. Skyline + Blimp, Los Angeles CA: The photograph for this painting was shot from the garden behind Walt Disney Hall in Downtown Los Angeles during intermission at a L.A. Philharmonic Concert. The blimp was hovering over the high-rise buildings and I snapped the picture just as it. 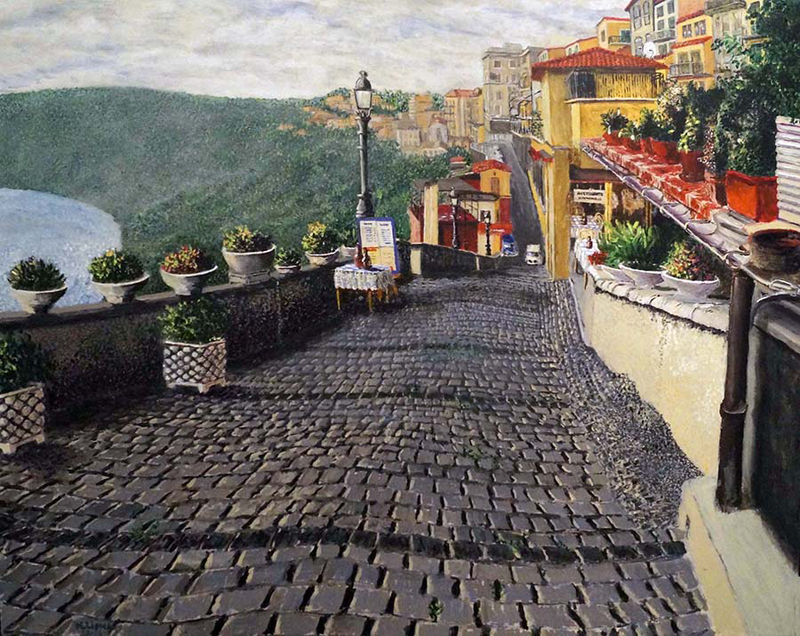 -- Nemi Village and Nemi Crater Lake, Nemi, Italy: An old stone road winds down the hill around the Nemi Crater Lake. 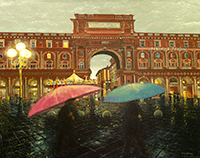 -- Piazza della Repubblica, Florence Italy: During World War II this was the Jewish Ghetto. Today it’s the center of luxury retail stores, street musicians and one of Florence’s most expensive hotels, The Savoy. 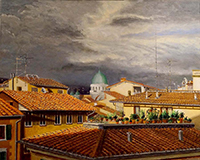 -- Rooftops of Firenze, Florence, Italy: View of rooftops of Florence, Italy with the Synagogue towering in the distance. 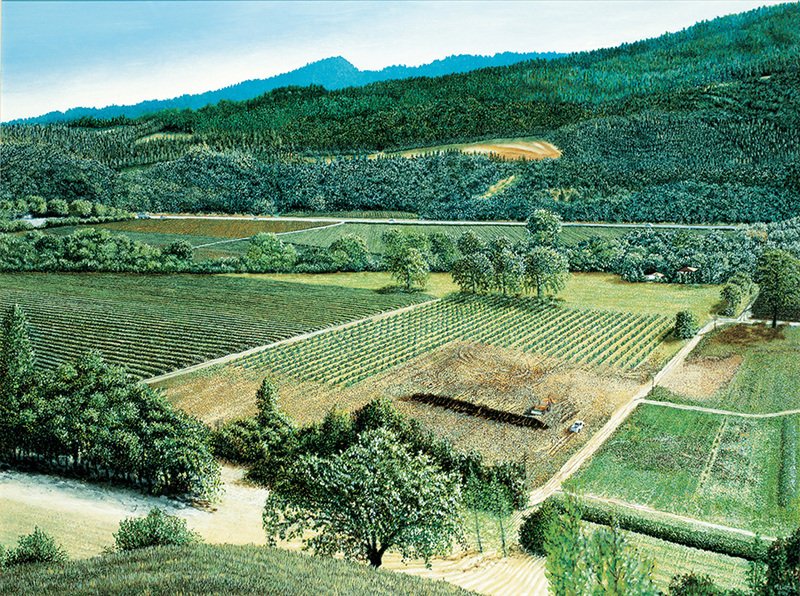 -- Sterling Vineyards Landscape, Napa Valley, CA: Sterling Vineyard is at a higher elevation than most of the wineries in Napa. In the background is Route 29, the spine of Napa Valley. -- View From My Apartment, Florence, Italy: View from my apartment in Florence, Italy, with view of the Synagogue reflected in the window. I've loved painting since I was a kid. 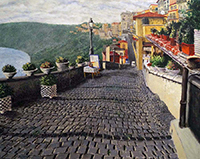 Later in life, as marketing director to many well-known recording artists, I could not pursue my love for painting because of the demands of business and global travel. When I made the decision to leave the music Industry, I traveled to Italy for several months a year to study at the Michelangelo Istituto Accademia d' Arte in Florence, Italy. 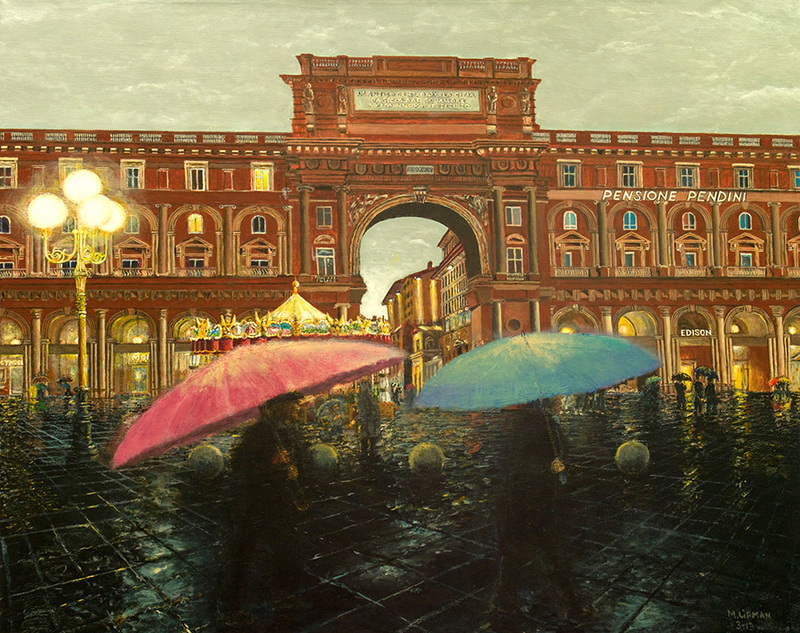 My passion for Italy, its beautiful, ancient landscape and its zest for life has served me well in the pursuit of art. I labor with intensity over the details and techniques of my canvases for months-on-end until the final brush stroke. I have recently been included in the International Contemporary Artists Book published November 2013, and the International Contemporary Masters Book, Vol. VIII, published January 2014. 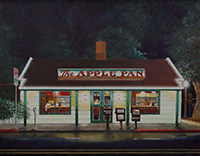 -- The Muriel Alvord Memorial Award from the 81st annual Hudson Valley Art Association Juried Exhibition in July 2013. 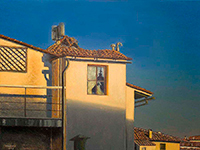 -- Oil Painters of America Exhibition - Mountainsong Gallery, Carmel, CA. starts August 30, 2014. 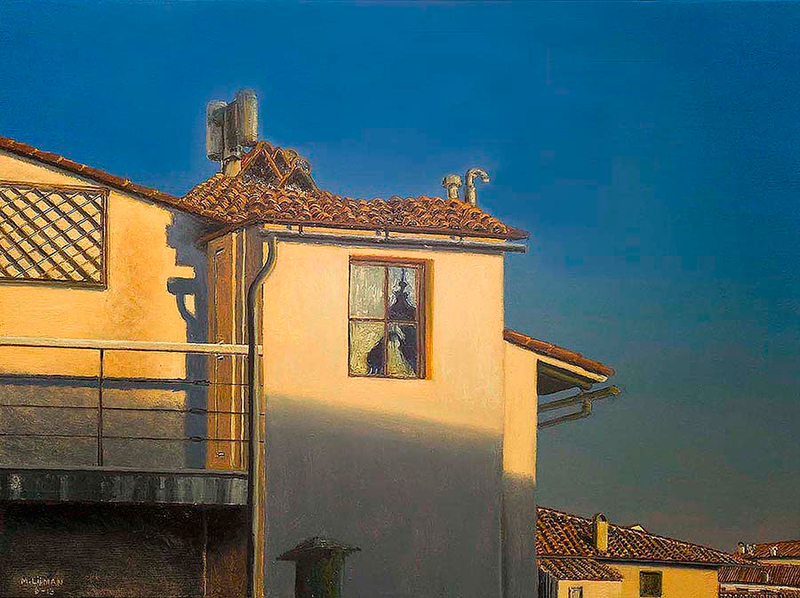 (Winning entry - View From My Apartment, Florence, Italy). -- Twenty-three Painting Retrospective at the Jewish Community Center, Long Beach, CA. TBA.